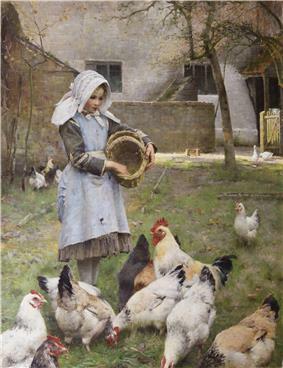 Walter Frederick Osborne (17 June 1859 – 24 April 1903) was an Irish impressionist landscape and portrait painter. Most of his paintings featured women, children, and the elderly as well as rural scenes. 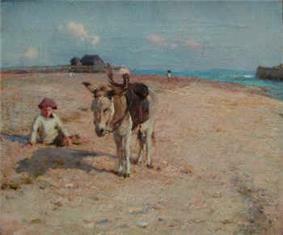 Walter Osborne was born in Rathmines, Dublin, the second of three sons of William Osborne, a successful animal painter. He was educated at Rathmines School and at the Royal Hibernian Academy school. He won the Taylor Prize in 1881 and 1882, the highest student honour in Ireland of the time, while studying at the Koninklijke Academie voor Schone Kunsten in Antwerp. He was influenced by the Flemish painter, Rubens, and the French realist, plein-air painter, Jules Bastien-Lepage. In 1883, Osborne moved from Antwerp to Brittany where he painted his famous Apple Gathering, Quimperlé, now in the National Gallery of Ireland. Soon after, he moved to England where he worked alongside Nathaniel Hill and Augustus Burke at Walberswick. In 1886, he was elected to the Royal Hibernian Academy and received many commissions for portraits. This was an important source of income, as he had no private means of his own. After his sister died he was involved in looking after her daughter, and his own parents became increasingly financially dependent on him. 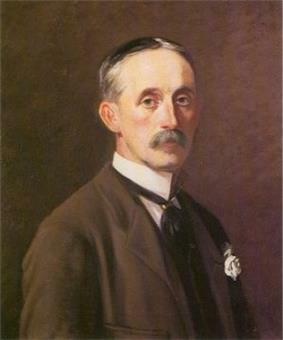 In 1892, he returned to Ireland to live in the family residence, and he also had a studio at No. 7 St. Stephen's Green. He spent a considerable amount of time painting outdoors, in Dublin around St. Patrick's Cathedral or in the country. He was well liked in social circles and counted the surgeon Sir Thornely Stoker, brother of Bram Stoker, among his best friends. He died prematurely at the age of 43 from pneumonia and was buried in Mount Jerome Cemetery. Some critics suggest that at the time of his death he was on the brink of his artistic maturity. His final work Tea in the Garden, a dazzling fusion of naturalism and impressionism, remained unfinished at his death and is now in the collection of the Hugh Lane Municipal Gallery in Dublin. In recent years his work has become highly sought after by collectors. Irish Art Archive - Walter Frederick Osborne - Milmo-Penny Fine Art (Retrieved September 24, 2006). "The Irish Impressionists, Irish Artists in France and Belgium 1850-1914". Julian Campbell. National Gallery of Ireland. 1984. Sheehy, Jeanne. Walter Osborne (Town House, 1991). Campbell, Julian. Walter Osborne in the west of Ireland (Adam's, 2004).